Malaysia is home to one of our favourite heritage cities in Asia: George Town on the island of Penang. The multicultural city is bursting with art, known for its mouth-watering food scene, easily walkable, and home to oodles of boutique hotels. Seriously, you can barely walk down the street without passing one on every block. With so many options to choose from, it’s hard to know which one to pick. So I’ve done the work for you: I’ve tested the comfort of beds, sampled the breakfasts, dipped in the pools, and scoped out the surrounding neighborhoods. After careful scrutiny, these are my picks for the best boutique hotels in Penang. Gorgeous design combined with modern conveniences subtly integrated into every room, impeccable service, a delightful swimming pool, daily afternoon tea, and an ideal location in the heart of the historical zone make Seven Terraces my absolute top pick. 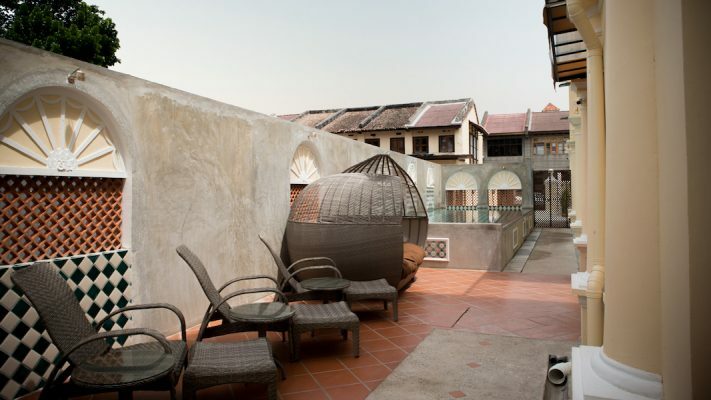 Of all the boutique hotels in Penang, this is the one to aim for. 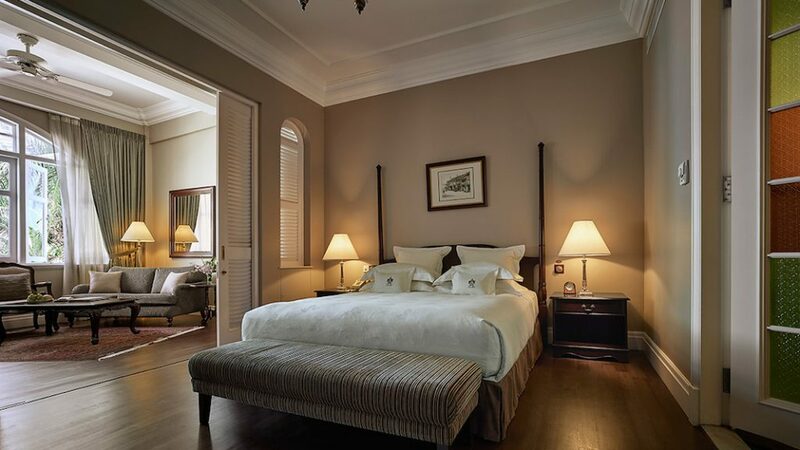 Lovingly restored from the remnants of 19th century construction, the hotel flawlessly combines history and heritage with contemporary luxury. 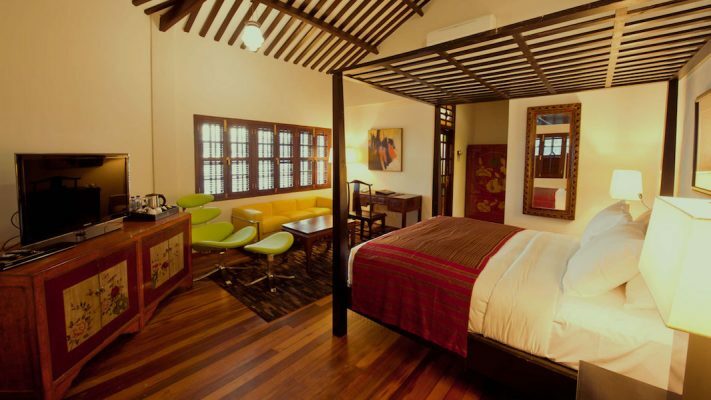 Each of the 18 rooms is beautifully appointed and no two are the same. The hotel’s owner has an incredible eye and a zest for tracking down pieces no one else can find. 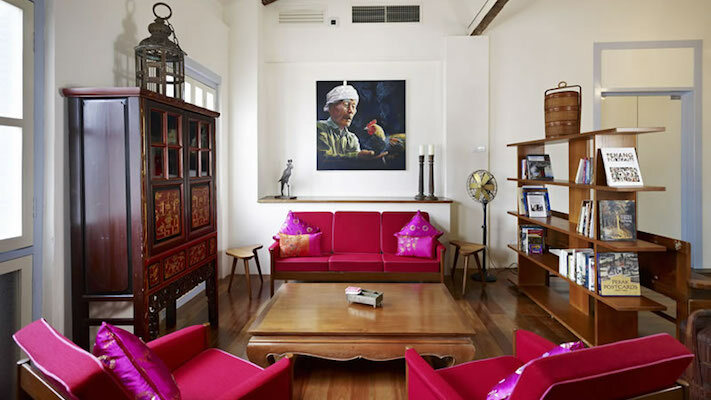 He routinely stops by to swap out artworks or antiques from his personal collection. 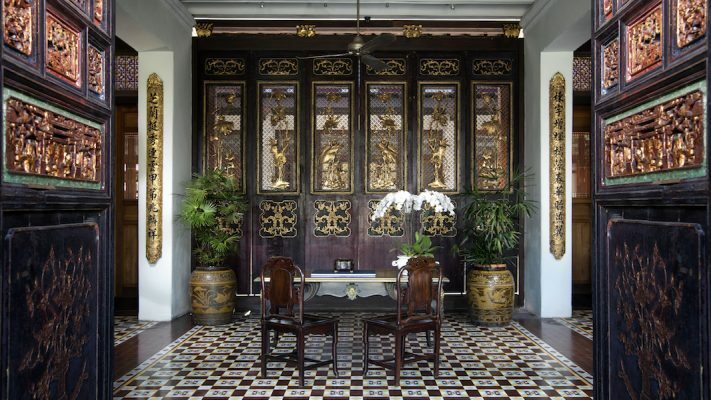 The end result is that walking into a room feels like entering the home of a wealthy straits Chinese merchant. 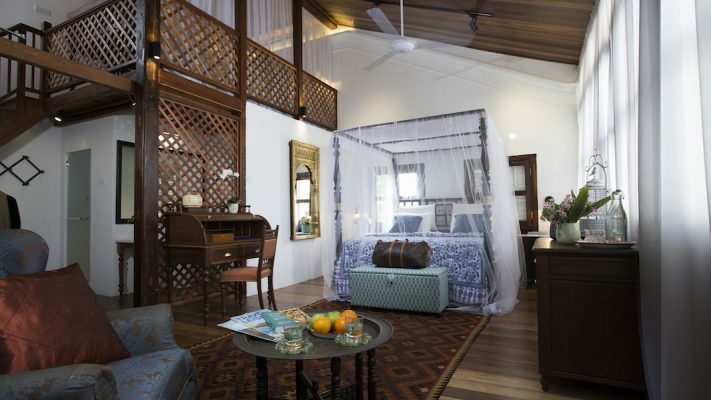 The furnishings are comfortable and elegant (including individually designed four-poster beds with inlaid antique woodwork) and when you open doors, drawers, and boxes, you’ll find all sorts of useful things. Forgot a charging cord? No worry, there’s a spare. Eager to try George Town’s street food but unsure where to start? Grab the handy guide to the owner’s favorite spots and set out. The rooms are set across two floors with a sitting area on one level and bedroom on the other so there’s plenty of space in which to spread out. In some rooms, the bedroom is upstairs with a half bath – the full bath being on the entry level off the sitting room – while others have the bedroom and full bath on the entry level. No room is a bad one but some have an extra surprise. I’m not allowed to give away what that is but when you book with me, I’ll do everything I can to get you one of those rooms. 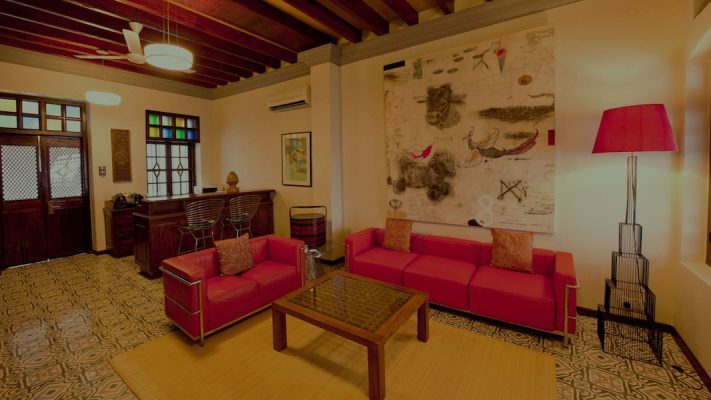 For families, there are two spacious apartments that comfortably sleep four. Fun tip: when you enter the hotel to check in, look at the doors. Then ask if there’s a story behind them. Learn more about Seven Terraces here. 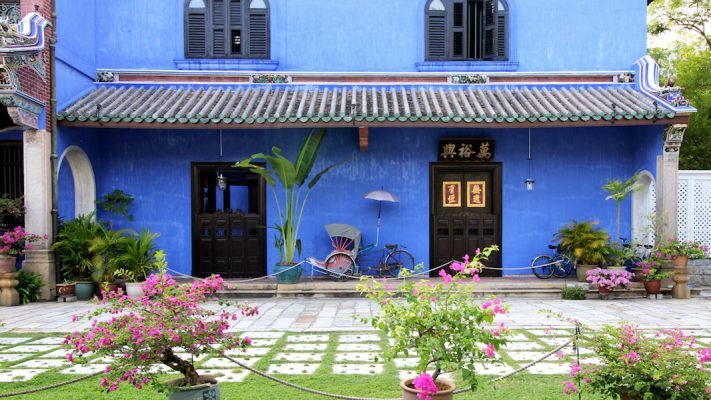 If you’ve ever wanted to stay in a museum, then the Blue Mansion is for you. As a hotel guest you’ll have the freedom to explore parts of the mansion that museum visitors never get to see. Plus you can take as many photos of the indigo walls as you wish in search of that perfect Instagram shot. Once dubbed the Rockefeller of the East, Cheong Fatt Tze built the Blue Mansion in the late 19th century to serve as the Penang base for his business empire and as a home for his sons and descendants. 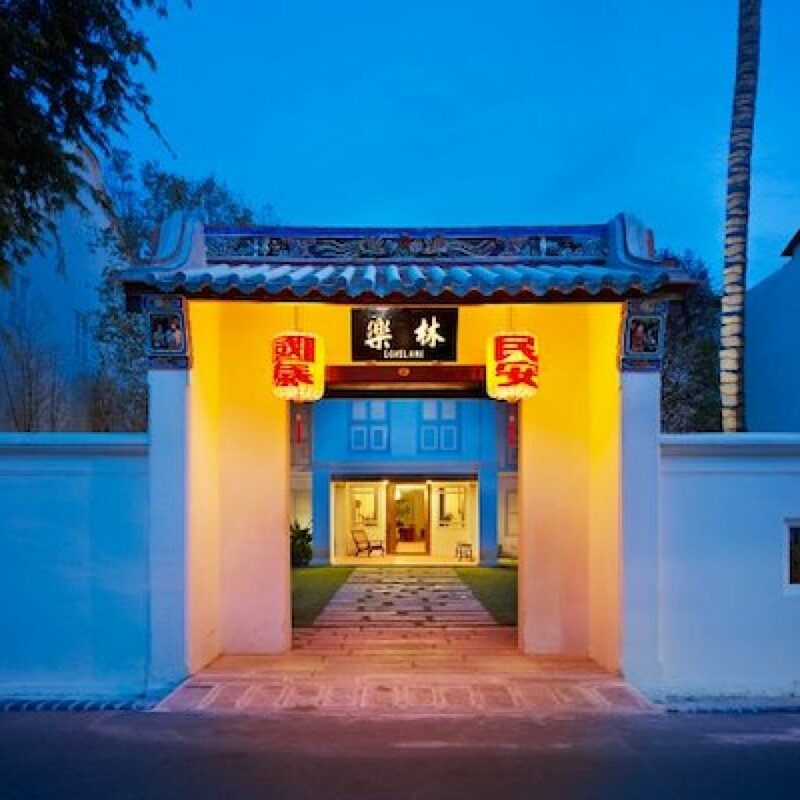 Designed to honor his heritage, the architecture is heavily influenced by traditional Chinese concepts with western elements such as art nouveau stained glass and Scottish cast iron works. As the mansion passed through his descendants, it fell into disrepair. After the last son died, it was purchased by a group of conservationists. 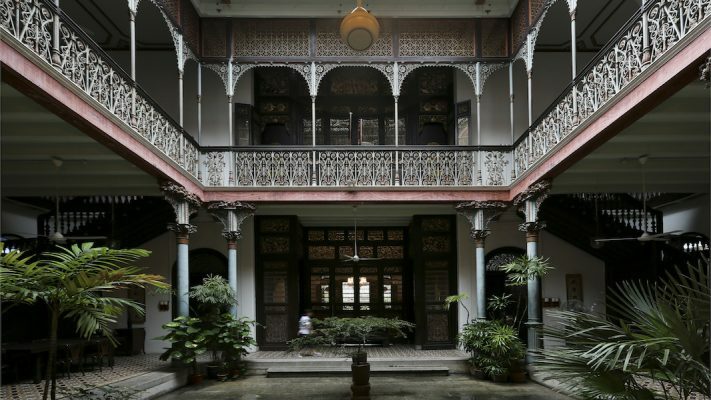 It took years and at least one courtroom battle that helped to preserve all heritage buildings in George Town but ultimately, the mansion was restored to a state of grandeur and opulence its first owner would have approved. 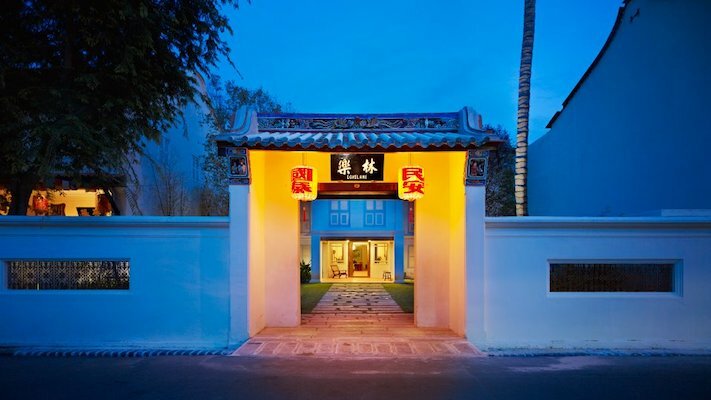 Today, part of the mansion is open to visitors for guided tours and the rest is an 18-room boutique hotel. All guests are invited to join a tour during their stay and can explore the grounds without a guide. 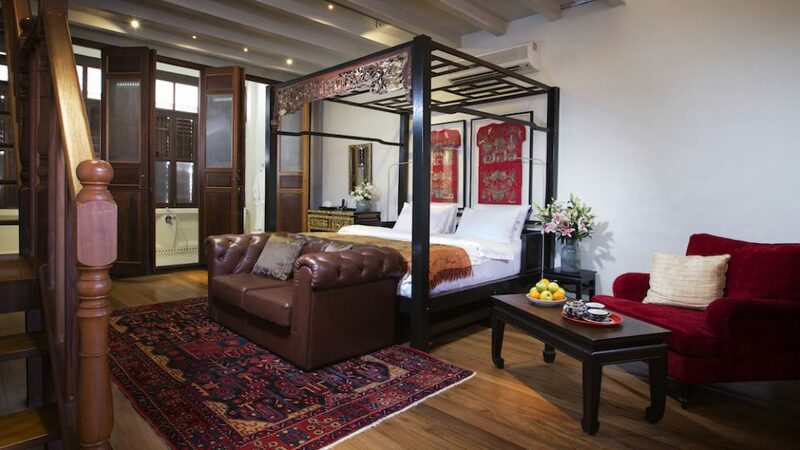 The rooms are spacious and elegantly appointed, especially the upstairs Han Suites which have a sitting area separate to the bedroom. 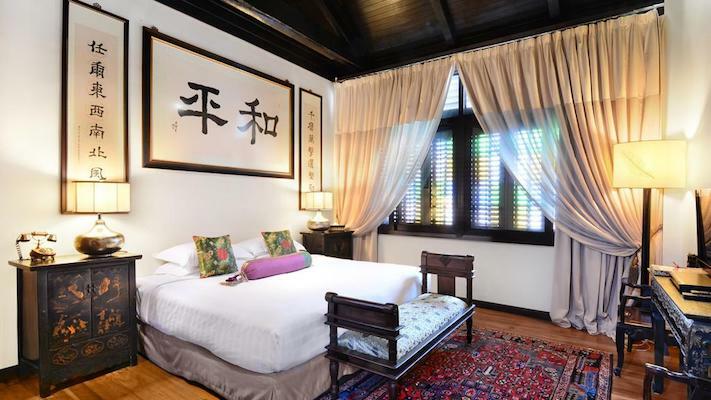 The rooms are adorned with antique furnishings, art work and ornaments collected by Cheong Fatt Tze and his family. Staying here truly feels like you’ve entered another era. Except for the swimming pool, wifi, and air conditioning, that is! Learn more about the Blue Mansion here. 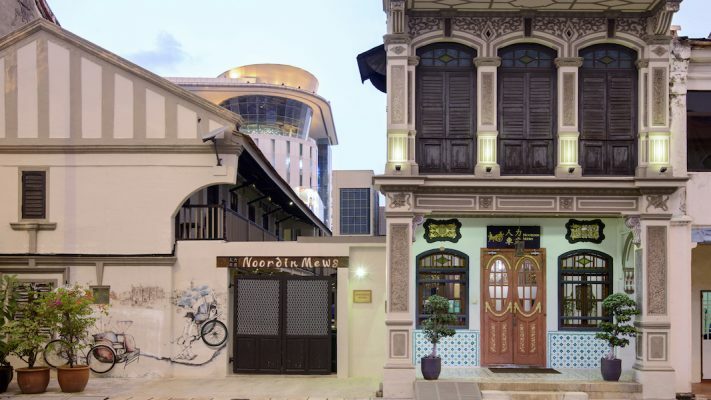 Once a 1920s shophouse with a long carriage way that housed trishaws, hand carts, and servants’ quarters, Noordin Mews is now a 16 room family and pet-friendly hotel. 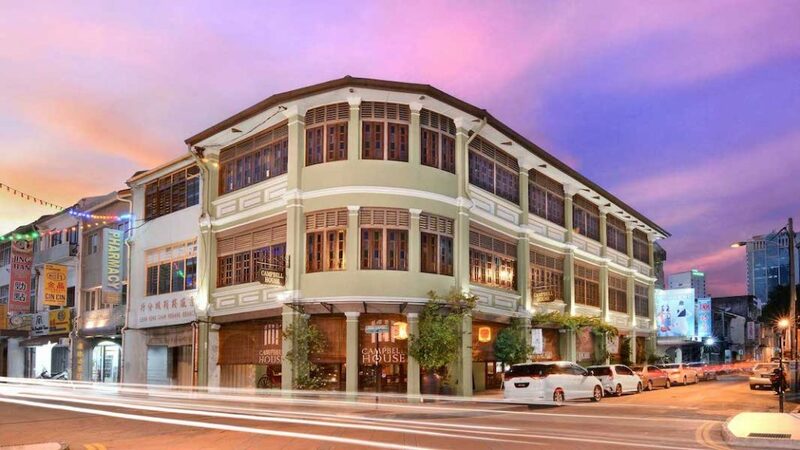 Located outside the tourist heart of George Town yet still easily accessible to the region’s sights, this hotel is an excellent family choice. Family rooms and suites have space for four and even the Mews rooms, the entry level category, can comfortably sleep one child with parents. It’s a pet friendly hotel and as many Malaysians use weekends to explore their own country, it’s common to spot a dog in the shady library. 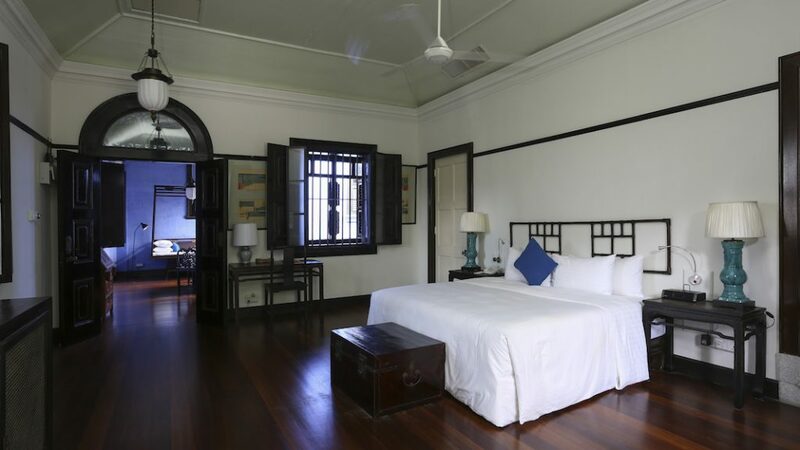 Most of the rooms have a contemporary feel with vaulted ceilings and plenty of natural light streaming in but a few heritage rooms preserve the building’s atmosphere. I love the character in these rooms with their hardwood floors and furnishings. 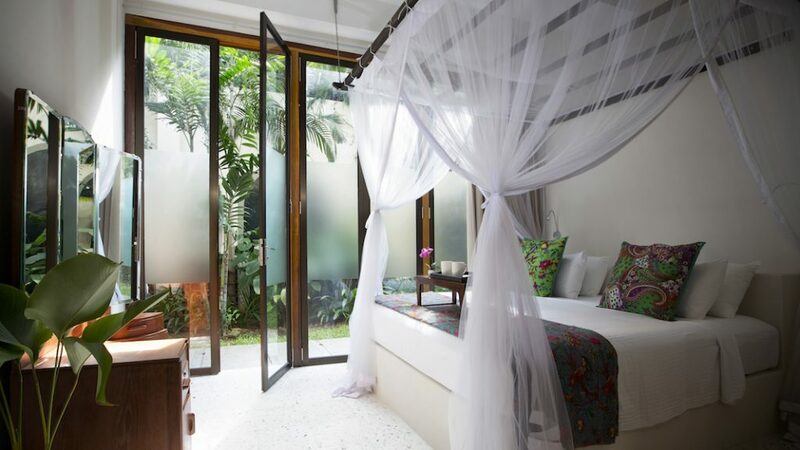 Then again, I’m a sucker for a four poster bed. 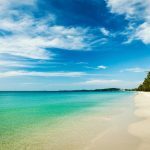 If you want to walk everywhere you go in George Town, then this might not be your best choice as it’s in a quieter part of town. There are plenty of restaurants around the hotel but when it comes to sight seeing, little feet will be happier with taxi or trishaw rides. 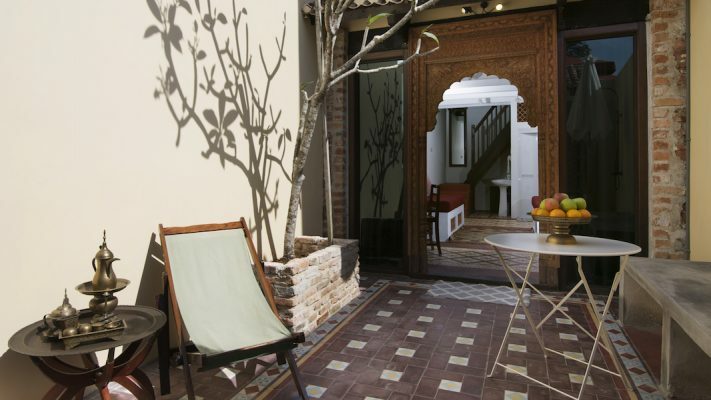 Read more about Noordin Mews here. 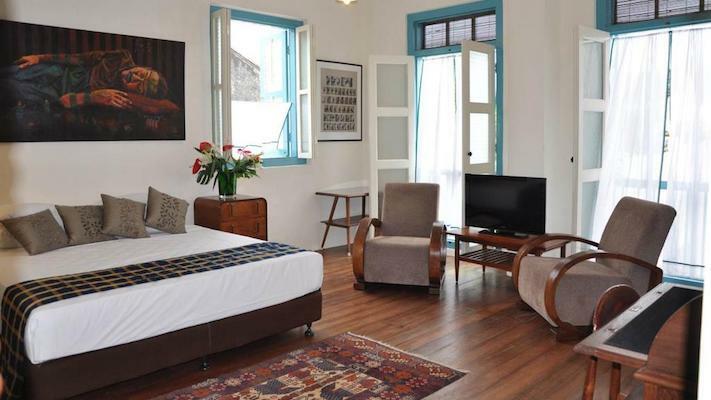 Once an Anglo-Indian mansion, this comfortable hotel feels like a true home away from home. Spacious suites comfortably sleep a family of four in rooms separated by a staircase while small villas offer unparalleled privacy for a family with two young children. Many of the heritage hotels in Penang highlight the region’s Straits Chinese and British colonial history. Jawi Peranakan blends elements of the island’s many influences including Indian and Muslim. The building itself is an eclectic mix of architectural styles so it’s only fitting that the design is, too. 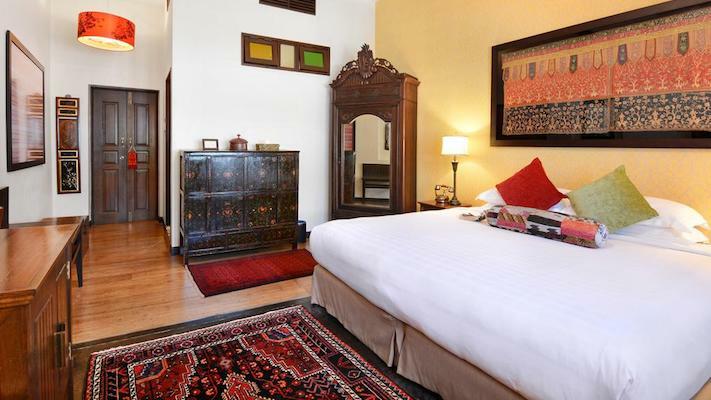 There’s everything from wool Kashmir throws to brass Mughal mirrors and upholstery hand picked based on the origin of the mansion’s original occupants. 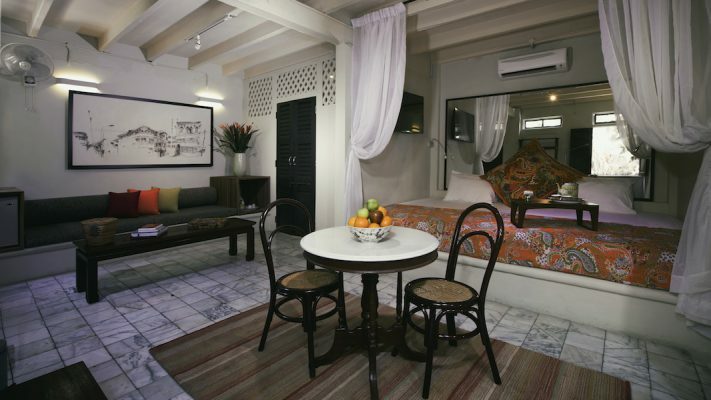 For a family, the mansion suites are one of the best choices in town with two bedrooms separated by a flight of stairs. On the lower level is plenty of space for all to sit and gather. My personal favorite though, are the villas. 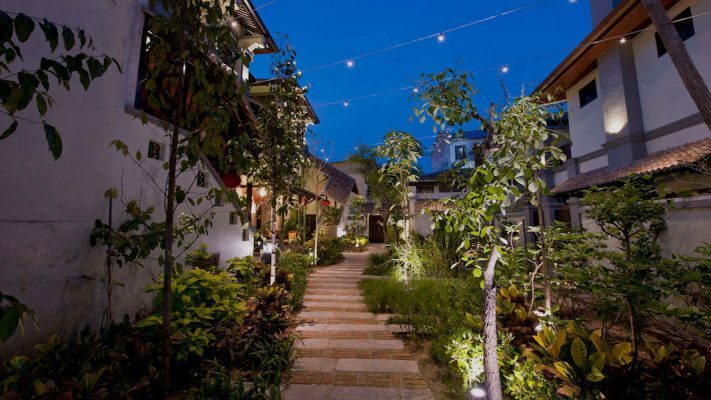 Each has a private entrance to a little courtyard that leads to a two-story suite. Two young children can sleep on the ground level although it may feel a bit cramped depending on their ages. 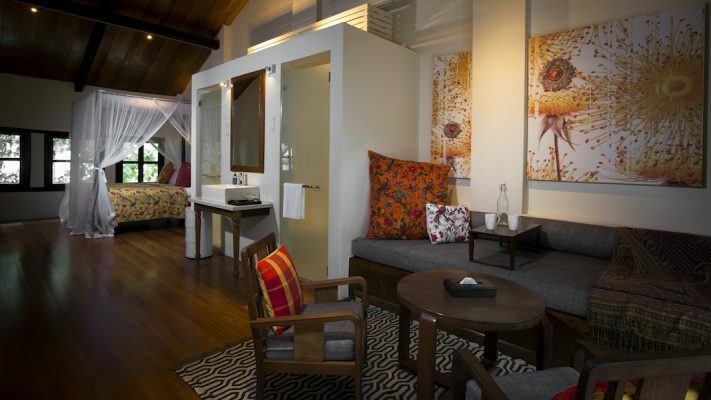 Upstairs is a king bed and each level has its own bathroom. 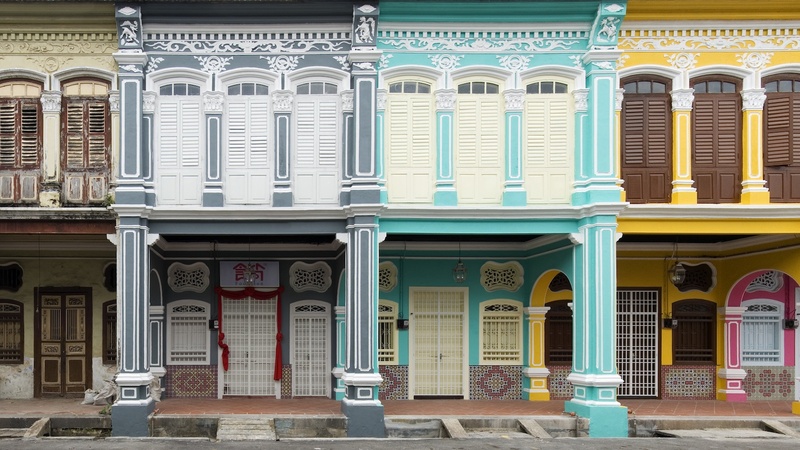 If the busy streets of George Town wear you out while sight seeing, the neighborhood around Jawi Peranakan can feel like a relief. 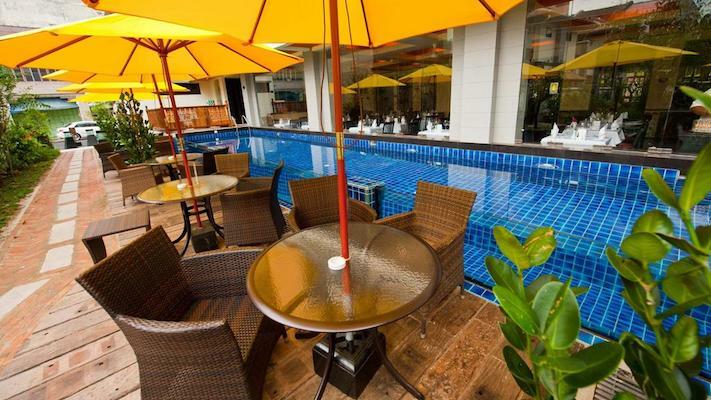 There are plenty of restaurants within easy walking distance and you won’t find the crowds in this part of town. 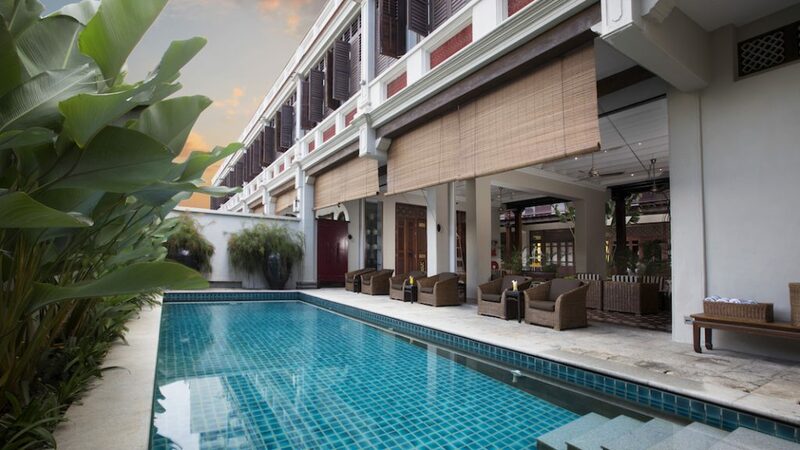 Like all of the family picks, there’s a swimming pool for those hours when the heat and humidity get to be too much. 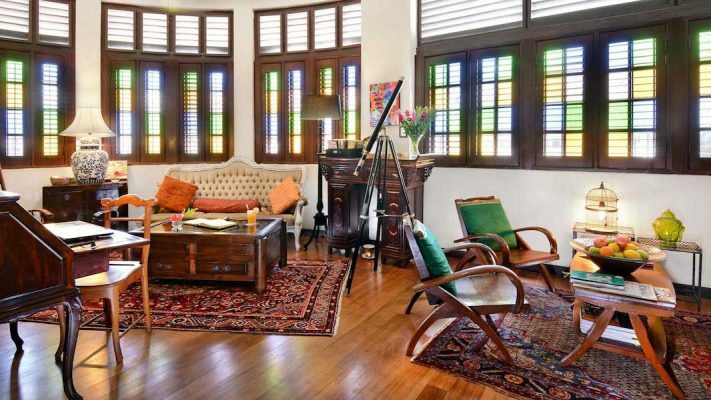 Click here to learn more about Jawi Peranakan. 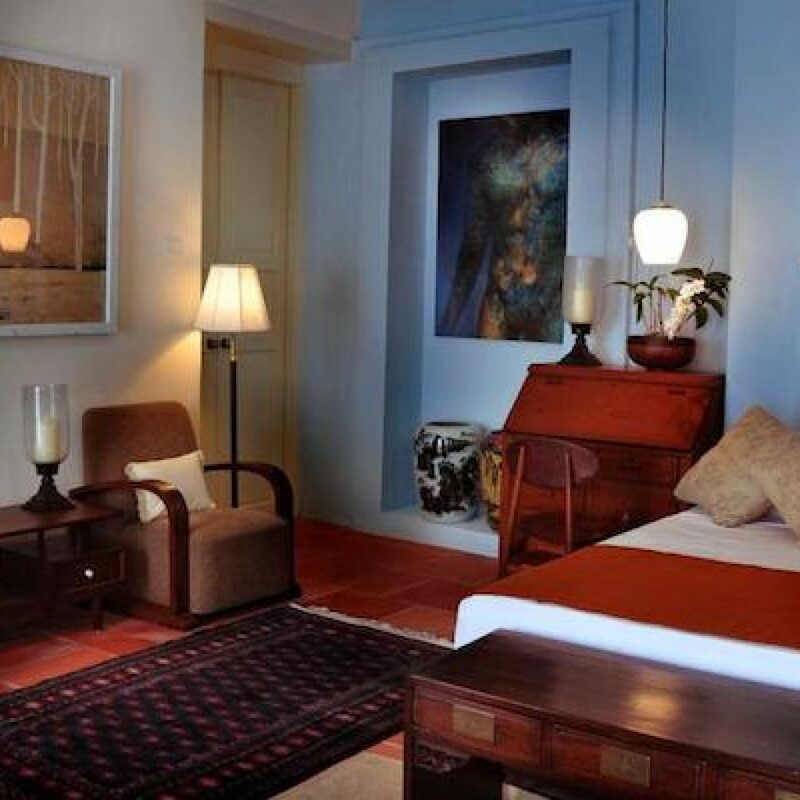 One of the few boutique hotels in George Town with a lift, Hotel Penaga has some excellent family options and is chock full of art commissioned for the hotel. 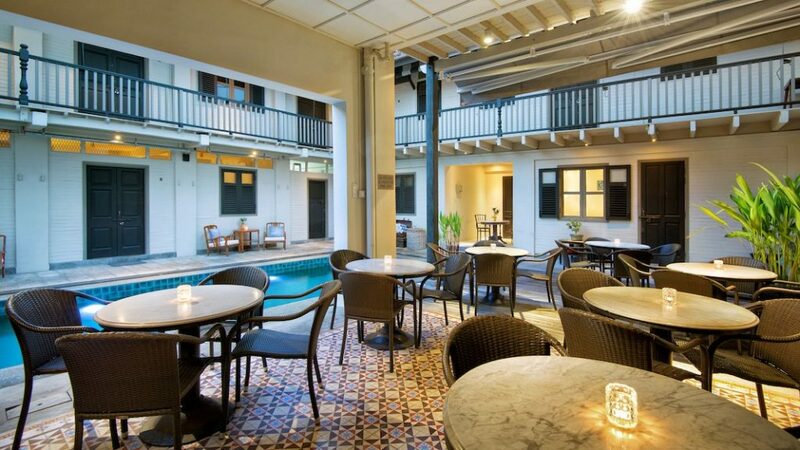 Once a set of 1920s shophouses and terraced houses, Hotel Penaga is one of the larger hotels on this list with 45 rooms. The original art deco influence permeates the renovated buildings which gives this hotel a different feel to others in the heritage city. With an artist-in-residence program, you’ll find commissioned works of art throughout the hotel, including on the walls of your room. 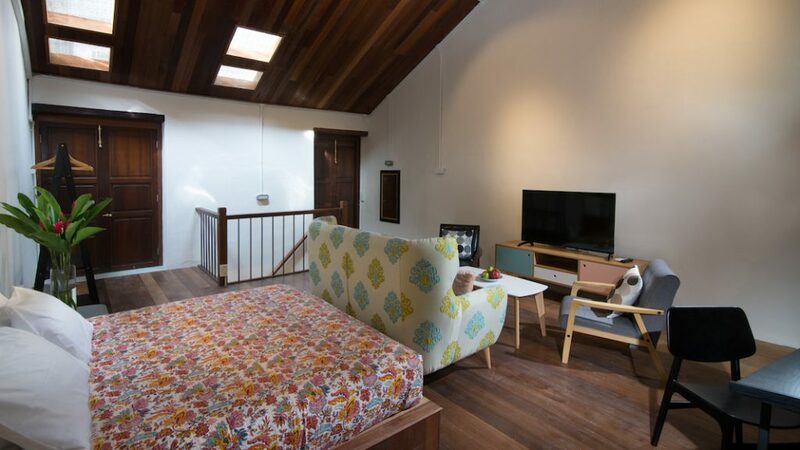 For families, Clark Terraces offer a ground level living space and bar area that can be converted to a kitchenette for long stays, a private garden with Jacuzzi, and two ensuite bedrooms upstairs. With a private entrance, each of the Clark Terraces is actually its own home. There are plenty of other room options for those who don’t need so much space and a swimming pool for cooling off on those hot and humid days. 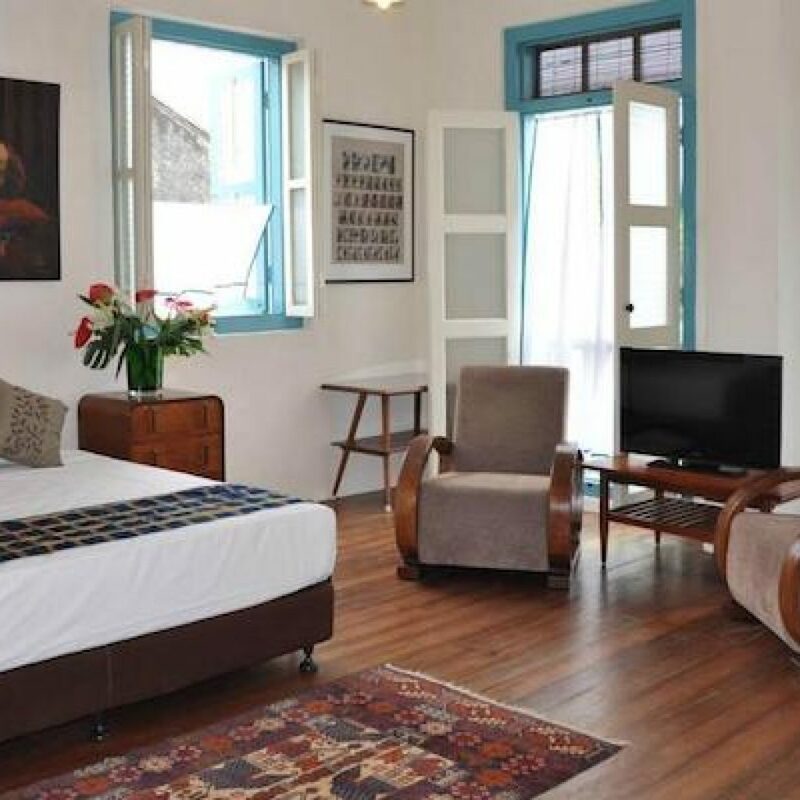 Find out more about Hotel Penaga here. Divided into two separate buildings, those across the way from reception include family suites that can comfortably sleep four or six. For very large groups, you can take an entire residence and sleep up to 20 people. 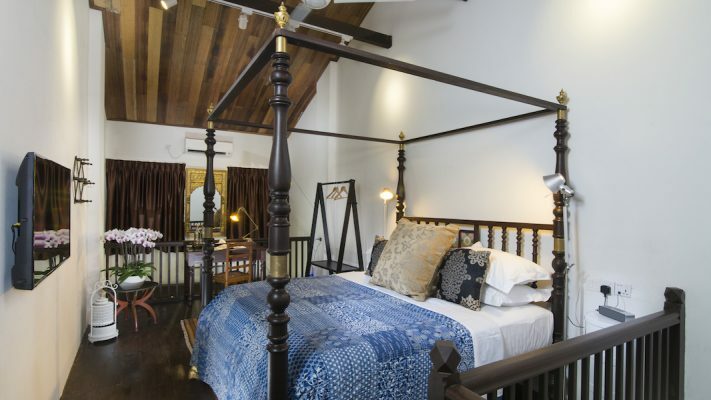 The heart of Muntri Mews are the Mews rooms and cafe built in what was once a carriage house and horse stables. The building dates from the late 19th or early 20th century and as these quarters were for drivers and other staff, they were never ornate. The clean lines of its design have been maintained and decor includes photos and portraits from the Edwardian era. There are also a few nods to the building’s equine past such as saddles and harnesses. Across the road are the Mews Residences where the family rooms are. 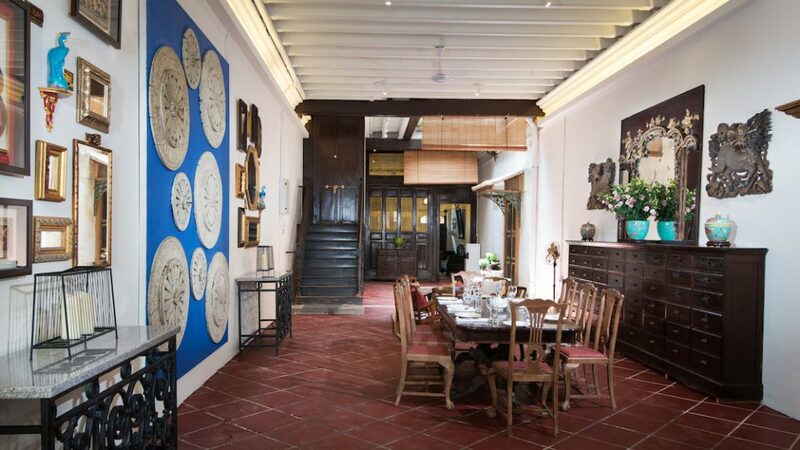 With an air well in each building, these are traditional Peranakan homes updated with contemporary comfort. 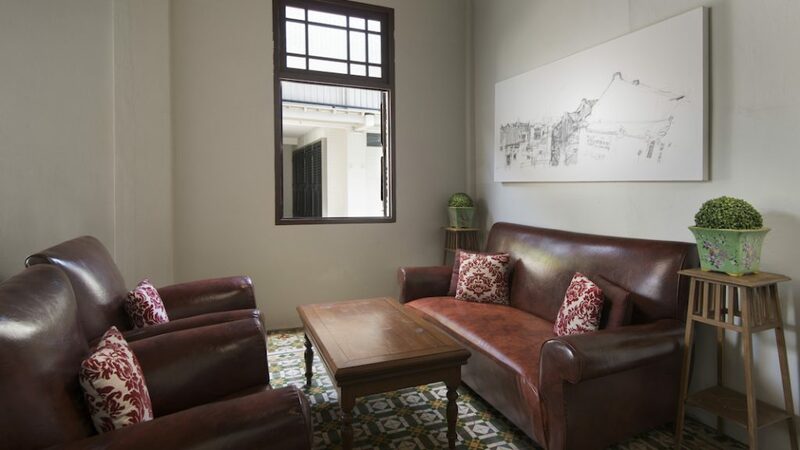 In one of the residences, exposed brick walls and elegant tiled floors greet you upon entry while the other opens to a dining area lined with art. Upstairs in both are a variety of bedrooms with a few fun touches plus all the essentials. 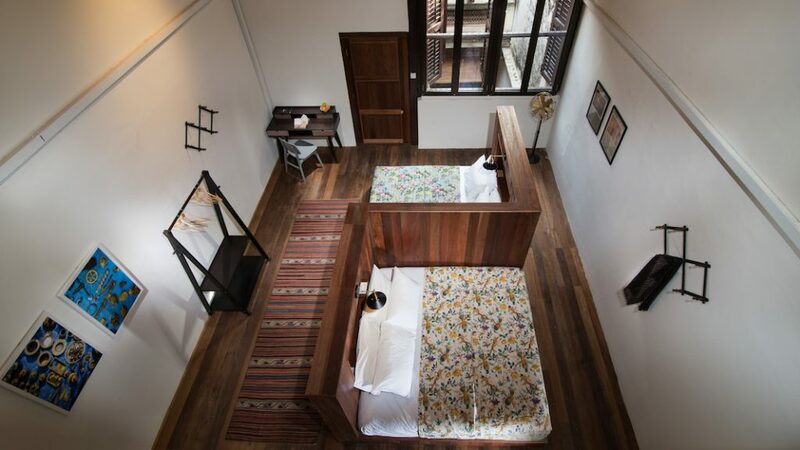 To maximize the space, many of the beds are separated by a partition or flight of stairs without any walls. So while you can accommodate quite a few people, everyone needs to be comfortable sharing the space! Click here for more information about Muntri Mews. One of the few hotels on this list that was actually built as a hotel, Campbell House has been lovingly restored and updated by a husband and wife team with years of experience in welcoming guests. Rates begin below £100/night, making it an incredible value. With only 12 rooms, the team at Campbell House goes out of their way to make guests feel welcome and comfortable. Not only will you get a map of George Town but if you want the help, someone will sit down with you and go over the highlights to help you plan your days. You can walk out of the lobby with a marked-up map leading you to local favorites and hidden gems. The rooms themselves are each unique, inspired by the cultures and artistry of southeast Asia. 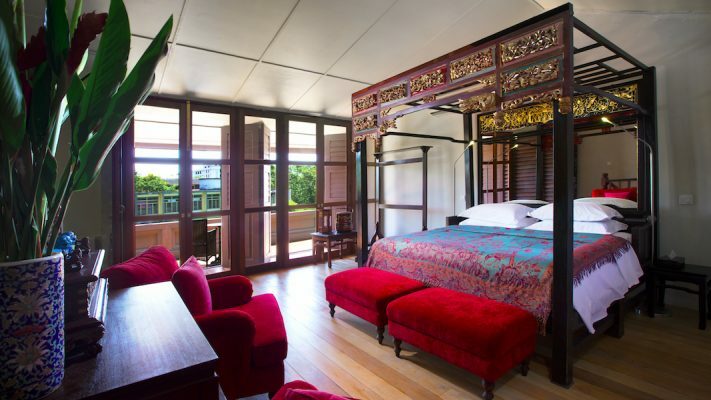 I’m partial to those on the upper floor for their vaulted ceilings although I also love the vibrant colors and silk headboard of Sari. 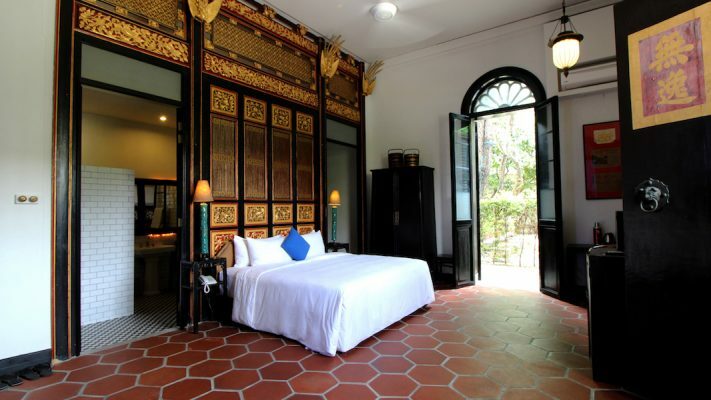 Because the hotel is a heritage building, original elements may be a bit surprising such as a small step into the bathroom and stained glass windows to prevent prying eyes. These are now augmented with clear panes to block out the street noise. There is no lift and in order to preserve the flooring, everyone must remove their shoes before heading up to the rooms. One of the best things about Campbell House: the restaurant. One-half of the ownership duo is an Italian chef so if you find yourself tiring of street food, Malay, Chinese, or Indian cuisine, you can tuck into some truly excellent Italian dishes. The breakfast, which is served a la carte, is huge and possibly the best of any hotel breakfast in George Town. For more about Campbell House, see here. Once a set of homes for 19th century workers who served the wealthy families nearby, this 16-room hotel is hidden away in the heart of George Town. 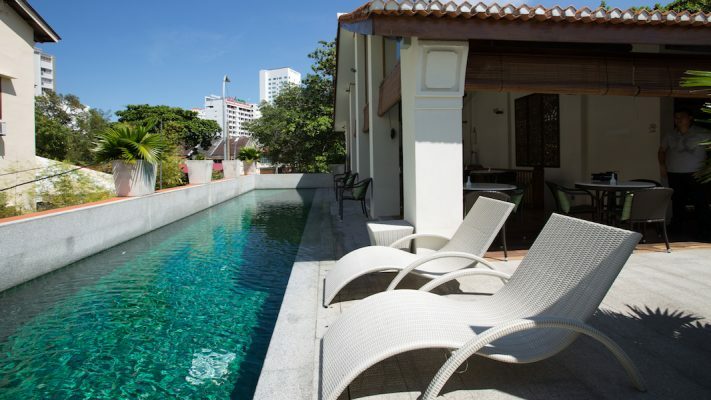 This is the only one of the budget category to have a swimming pool. 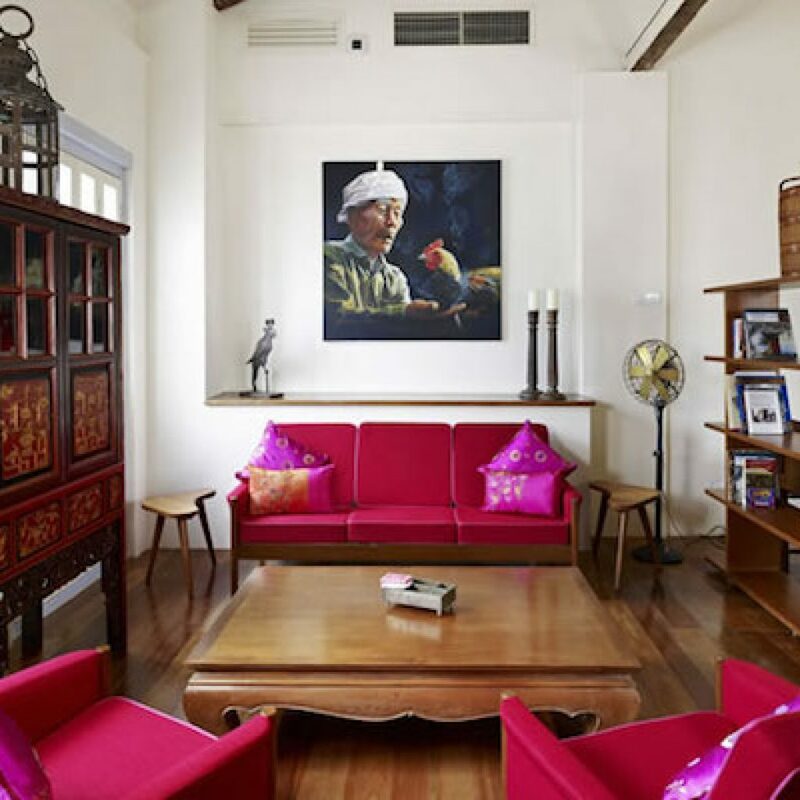 Run by the same man behind Seven Terraces and Jawi Peranakan, Muntri Grove was carefully renovated and updated with an incredible eye and the service standards are exceptionally high. Original details such as doors, windows, and roof trusses were repaired and incorporated throughout the hotel. The aesthetic here is contemporary with vibrant motifs creating a botanical theme in the guest rooms. I prefer the upstairs rooms off the long verandah for their hardwood floors and vaulted ceilings (have you noticed a trend, yet?) but the ground floor rooms let in ample natural light so you can’t really go wrong. 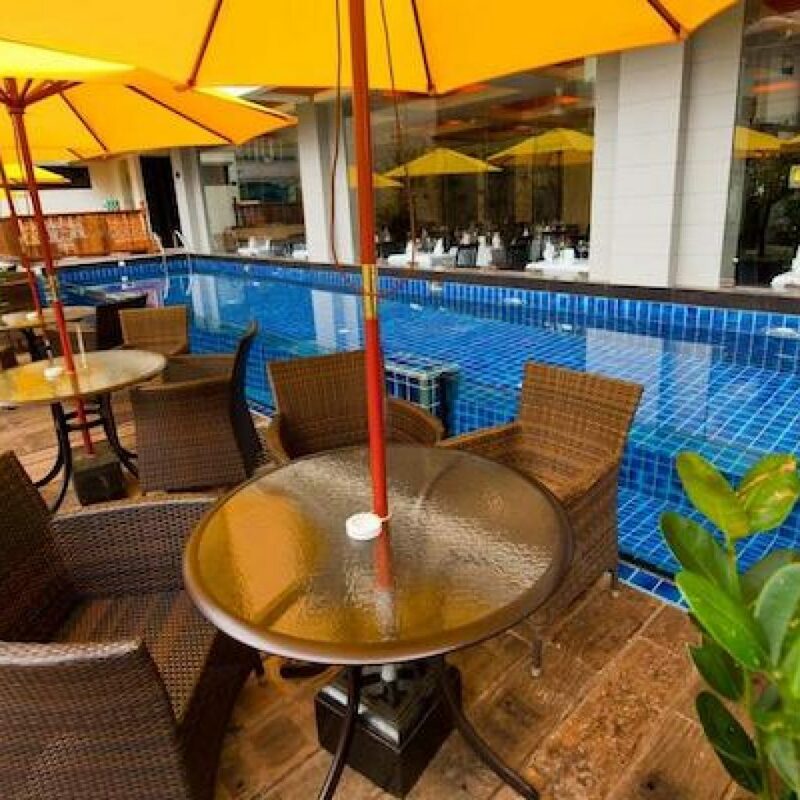 There’s no full restaurant here, only breakfast is served poolside. Within walking distance are more restaurants and food vendors than you can count so you might not even notice the lack of an in-house restaurant. 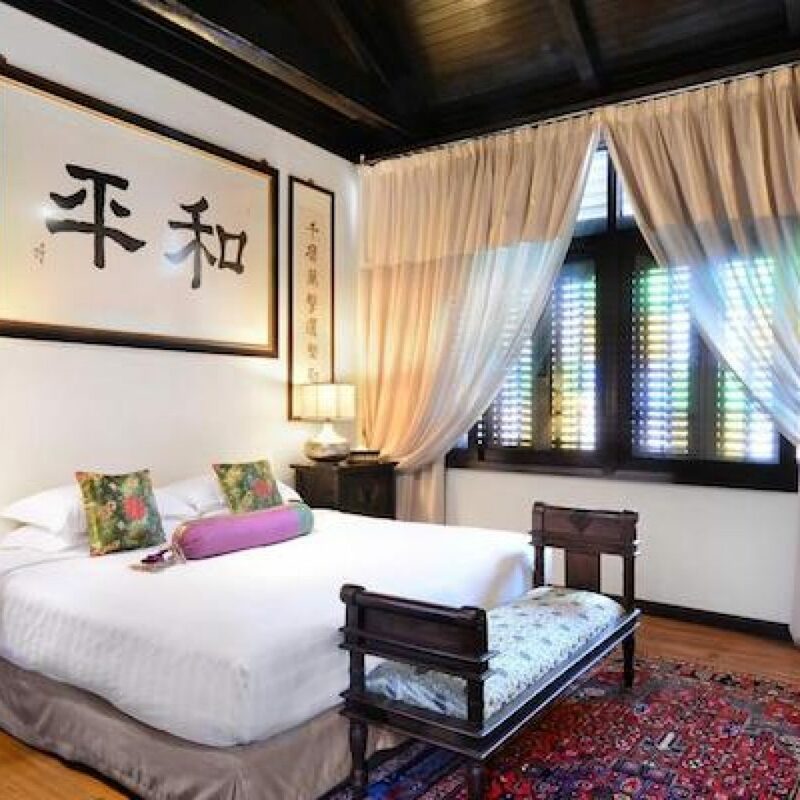 The hotel is hidden behind the Mazu Temple and sits amidst lush tropical gardens so returning from the steamy streets of George Town feels like retreating to an oasis. 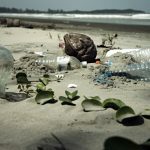 Learn more about Muntri Grove here. Contemporary art fills each unique guest room in this cosy hideaway on Love Lane. The buildings were constructed at different times beginning in the 1800s, all carefully renovated in keeping with the five original architectural styles. There are only 10 rooms in the main walls of 23 Love Lane and each one offers something different. Three of them are inside the Anglo Indian Bungalow which has a comfortable library upstairs filled with books, magazines, and board games. And, as with every part of the hotel, plenty of contemporary art to check out. My favorites are the two rooms of the 1920s Jack Roof Annex rooms for their high ceilings and vibrant splashes of color accenting a black and white theme. 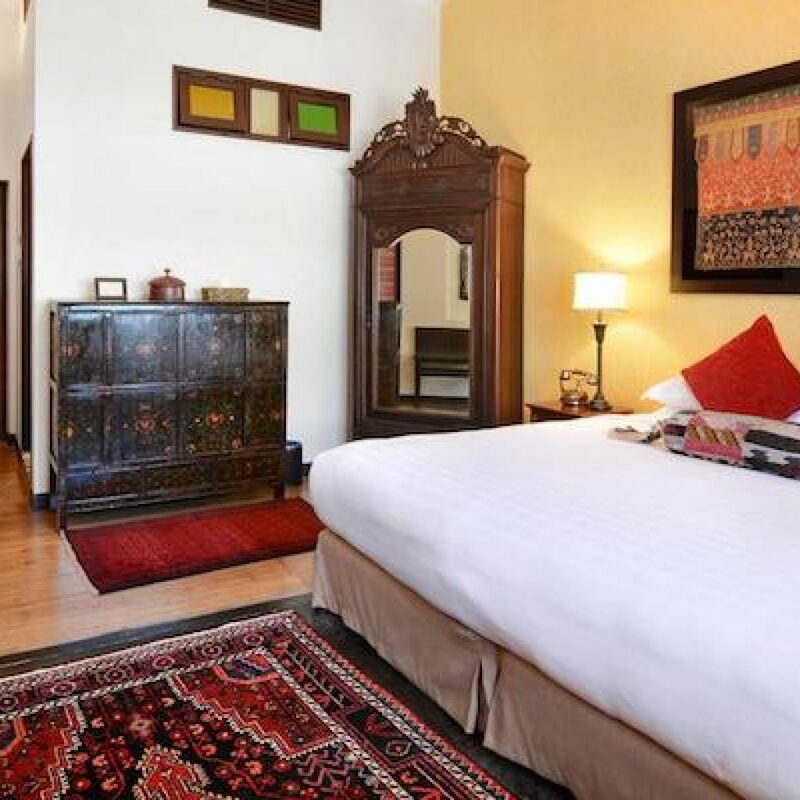 The four rooms of the Straits Eclectic Building are spacious and comfortable with area rugs over tile floors and decor in keeping with the building’s name. For a family, there’s the Indian Shop House which has two en-suite bedrooms, one upstairs under the eaves, and one on the ground level. A few minutes’ walk from the hotel are the Muntri and Stewart Suites which are full suites and not fit for the budget category! 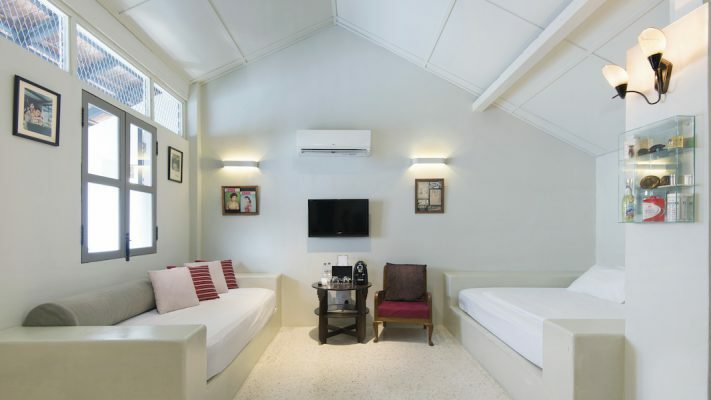 Love Lane is known for its backpacker vibe centered around Lebuh Chulia which is just a far enough walk from this hotel that you’re completely removed from the scene. You may, however, find yourself walking past crowds of drinkers overflowing from bars onto the street in the evenings. Learn more about 23 Love Lane here. 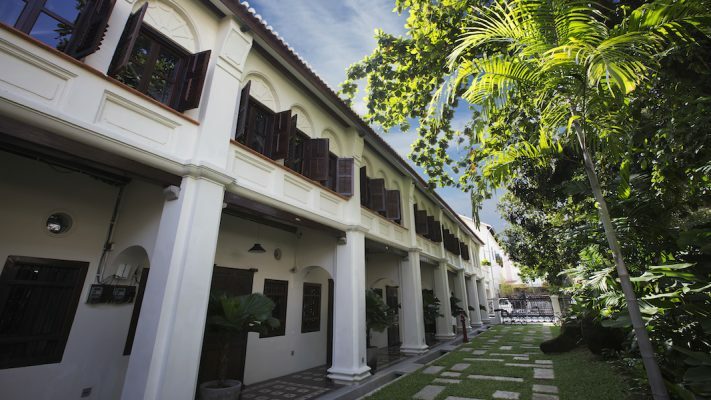 At 100 rooms, I can’t call this a boutique hotel but the Heritage Wing – the original E&O – is worth a mention. Built in 1885, the E&O harkens back to the colonial era when Penang was known as the Pearl of the Orient. 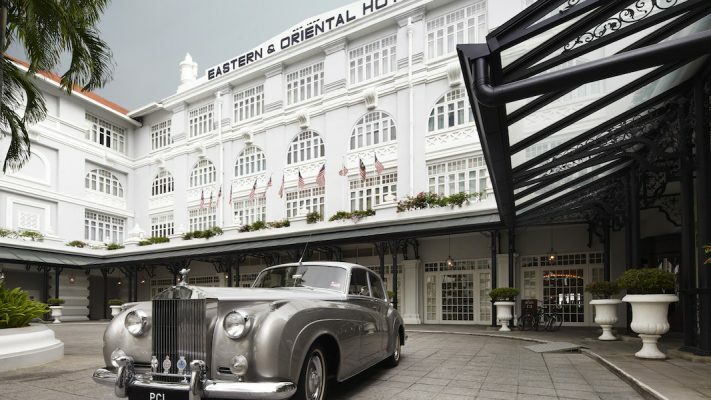 Big hotels like this aren’t usually our cup of tea around here but the E&O’s Heritage Wing is an exception. 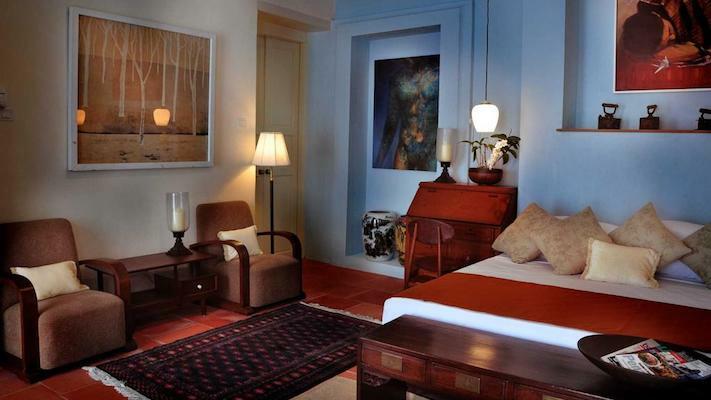 Each of the suites is spacious, handsomely appointed, and pays tribute to the hotel’s rich history. From the personalized check-in to the 24-hour butler service, it’s impossible to not feel like a VIP. Before the Sarkies brothers opened The Raffles in Singapore and The Strand in Rangoon (Yangon), they opened the Eastern & Oriental. At the time, it had the longest seafront of any hotel in the world at 902 feet long. Throughout the years, the hotel has welcomed Noel Coward, Rudyard Kipling, Somerset Maugham, and countless other notables. When I visited, the staff may have been setting up suites for a royal visitor. And if a hotel is good enough for royalty, it’s good enough for us! Read more about the E&O here. There you have it, my top picks for the best boutique hotels in Penang. 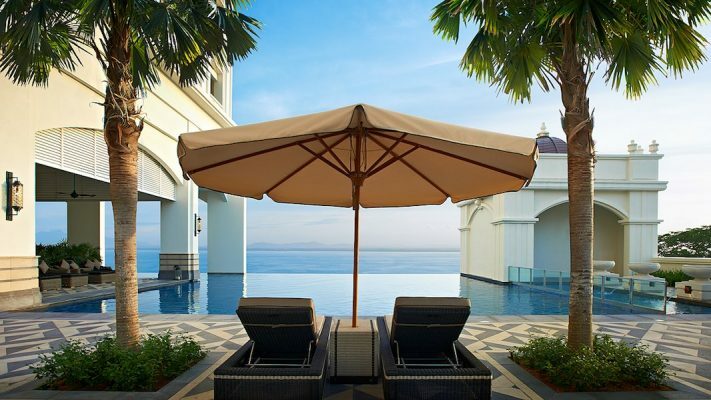 If you’re considering a visit to the island of Penang and the city of George Town as part of a trip to Malaysia, email me at marbree@fleewinter.com. I’d love to plan an amazing tailor made holiday for you!